If you are looking to sell a gold band or ring, you've just found the best buyer! 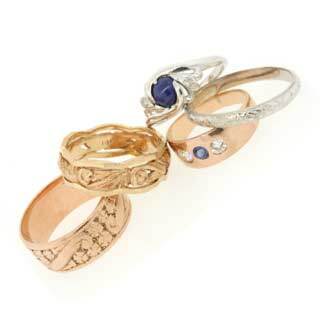 We are interested in buying your entire collection of old gold rings and bands. Sell old engagement rings, wedding bands and even anniversary bands. We buy diamond bands and eternity bands including gemstone rings. Do you have an old class ring that you never wore? Gold class rings are usually very heavy and can have several hundred dollars worth of gold in them! No matter what the ring, if it's gold, white gold, or platinum, we want to buy it. The heavier the ring, the more it will be worth. Gold rings can be made of 10k, 14k, 18k, and even 22k gold or platinum. The value of your gold ring is based on the weight of the ring and the purity of the metal. The higher karat gold will sell for more per gram than the lower karat gold. Thin ladies ring usually weigh a couple grams and may be worth $30 to $60 dollars on average. Heavier ladies rings and mens rings usually weigh 5 to 10 grams and can be worth $100 to $300 and more depending on the actual weight. Spot gold refers to the current market price for pure 24k gold, and it changes daily like the stock market. The higher spot gold is, the more you will get for your gold jewelry. The number one choice for selling gold Rings in Chicago! 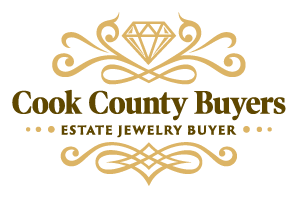 We are you premier choice for selling unwanted gold jewelry, silver, and diamonds in Chicago land. Call Mike for the personal service and attention you deserve. Choose a one on one meeting at his Skokie office, or even your favorite restaurant or cafe. Mike is available to meet 7 days a week for your convenience. Please call (773) 490-9828 to schedule a meeting.